and if it has peanut butter even better! I have a weakness - an edible and sentimental one for Reese's. First, I plain love them! and there will be ice cold Reese's Peanut Butter Cups in the refrigerator. I am in charge of cookies for the Bunny Brunch coming up at my daughter school...and my daughter had some grand ideas about what she wanted me to make (seriously where do they get these ideas!? )...but instead I made these and she loves them..I love them..we all love them...and they are EASY! Stir in chocolate chips to combine. Bake at 350 for about 10 minutes - watch the time - each oven is different! Remove from oven and do not set atop the stove - place pan on a cooling rack. Let the cookies cool for about 3 minutes. 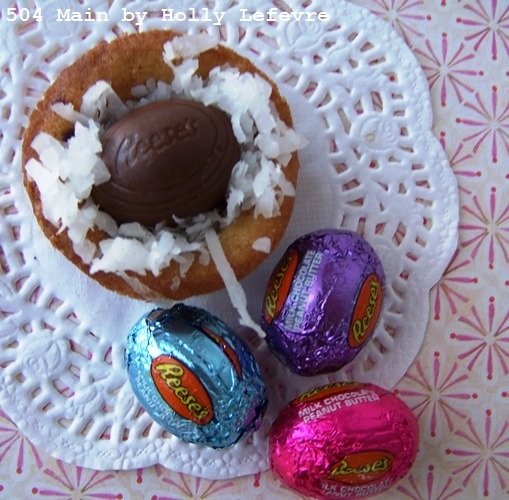 Sprinkle the coconut atop each cookie and then gently press the Reese's egg into the center of the cookie - the coconut makes a nest for the egg! Grease a mini muffin pan (or use liners). I used Baker's Joy to spray my pan. Cut each of the Simply Cookies in half. because believe it or not some people do not like coconut (gasp!)! and most importantly super yummy! Serve them on a bed of coconut and enjoy! 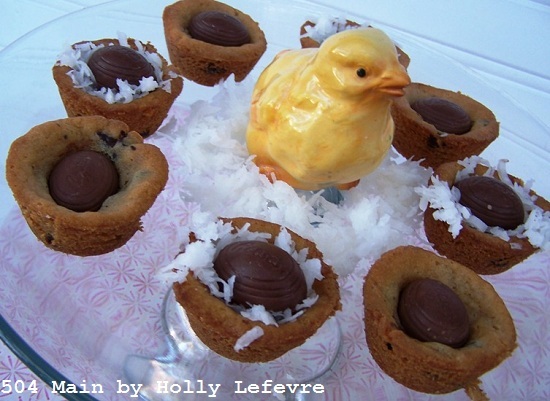 Do you have a favorite Easter Treat? Mmmm...those would be dangerous to have around! Oh, my goodness, Holly! This is too much. I mean, how much more perfect can you get? Cookie dough, already made, coconut, chocolate AND peanut butter--all in one sinful cookie/cup! I think I have some cookie dough in the freezer. It may not be choco-chip, but whatever is in there might just work. Got to get me some of those peanut butter eggs! 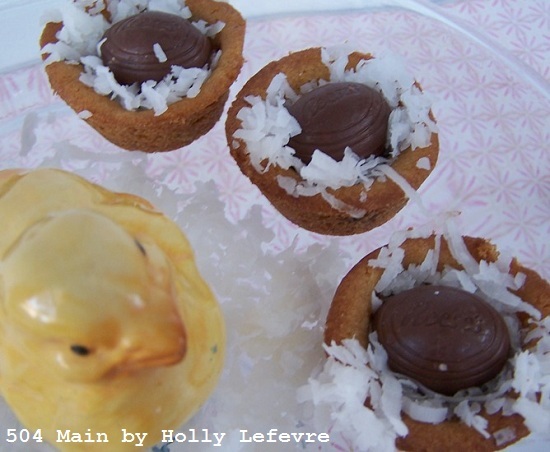 These are so cute and fun for Easter!! I must try them! Pinned! 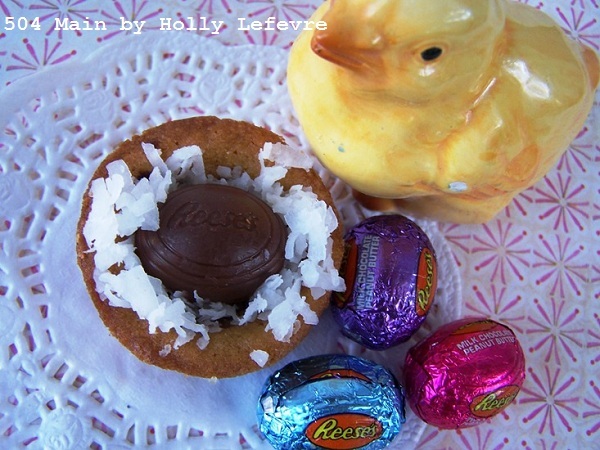 Those look delicious, Holly ... and the perfect treat for Easter! My hips don't thank you but my taste buds do! Hope you and your family have a very Happy Easter! Cute and delicious...what more do you need? Thanks for sharing, Holly! How Could I Not #LuvSoFab!? An Everyday Breakfast: Start the Day Off Right! Spring Dress Shopping with My Girl!